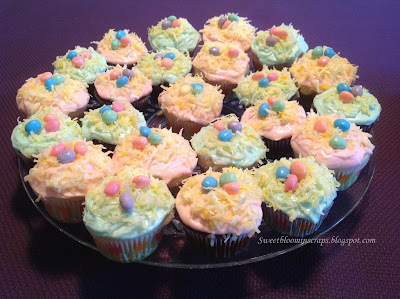 Just wanted to share my Easter Bird's Nest Cupcakes with you. I spent the afternoon making these for our Easter family dinner. I'm sorry I haven't done many posts lately. I have been busy with coordinating the the Sweet Sketch Wednesday sponsorships and trying to catch up on things on the homestead. I've also been enjoying my grand daughter and new grand son. Now I have five little munchkins to enjoy! Each one is so fun! Hoping they will enjoy the cupcakes tomorrow. 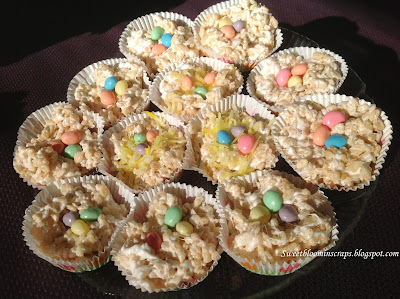 I still need to make some rice krispy bird's nest for one of my grand son as he is allergic to dairy, nuts and gluten. I will make those this evening and add the picture below! Mix together and spoon into paper muffin cups in a muffin pan. I added coconut to a few of them but decided that I almost liked them better without the coconut. If you are wanting to make a more defined shape, you almost need someone to help you as the treat begins to cool too quickly. Enjoy! These look great. I am going to have to pass your allergy free treats on to Tara. Sam and Logan saw the cupcakes and desided that I need to make some. Yummmm Thanks for sharing Judi. These look fantastic! I'm sure they loved them all!